Wang-Ching LIU’s series of books helping you learn Mandarin Chinese quickly & efficiently. 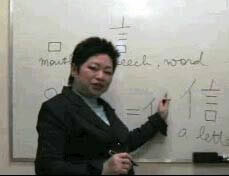 *Free* Mandarin Lesson on Video "Learn 4 CHINESE words in 3 minutes"
with her series of books mentioned above. She offers small group and private teaching in Montreal (Quebec), Canada. Universities, colleges and language school are welcome to contact Wang-Ching to learn more about her method of teaching and training teachers to use her books so that they will be able to teach Mandarin Chinese in a very efficient way. iSPEAK READ WRITE MANDARIN CHINESE. Although I tried learning mandarin prior to meeting Ms. Liu, it is with the support of her unique method of teaching that my progression really took off. The structure of her books is brilliant and quickly allows the learner to build a sound understanding of the fundamentals of Chinese. I recently successfully passed the HSK Level II exam and I know that, with Ms. Liu's teaching, my learning is well-rounded and will lead to great success. Chinese seems like an impenetrable language for many foreigners, but, with Mrs. Liu's method of teaching, not only is it fun to learn, but it is also incredibly easy and fast. I can now add Chinese Mandarin to the list of languages I am comfortable speaking and all this in only a few months. Wang Ching Liu’s teaching method is very unique and very effective. The Mandarin language and the Chinese characters are very easy to master thanks to her methodology which empowers the learner and allows him/her to seize the meaning and logic behind the language. Wang Ching Liu’s method allows the learner to understand in an intelligent way, instead of letting him/her learn like a robot which can’t think by itself. Thanks to Wang Ching Liu’s method, the learner will be able to continue improving him/herself in the language on his/her own. I hereby attest that Ms. Wang-Ching Liu's books where extremely helpful in the development of my written and oral skills. Spending sometimes half an hour or an hour a day practicing, my improvement was phenomenal. Her books are user friendly and help you understand how the Chinese people think and how they speak. Each of the two books its uses. One of them guides you step by step on how to write Chinese characters, while the other explains conversations and how to pronounce the proper sentences in the right way. All in all, in the few months I had time to practice Mandarin, I have seen great improvement. I recommend to you these books. They will help you learn Chinese in an easy and fun way. Book Review: "Travel to China with my pocket book : speak Mandarin right away has over 100 lessons, cultural facts and travel information! This book is a must read for anyone planning on travelling or doing business in China!" Beverly Hills Language Classes Over 25 beginner, intermediate and advanced language classes in Los Angeles with expert university educators & textbooks at affordable prices. Yes! Chinese is a Chinese learning system which is aimed at oversea youngster and developed by Yes! Chinese cultural diffusion co ltd and HQ of Confucius Institute. It includes of printed teaching material, online courses, interactive multi-media CD and teaching services. Yes! Chinese adopt for new Chinese teaching idea and method to combine printed teaching material with interactive multi-media CD and round by 5C of the world language standard. Yes! Chinese is also adopted for the standard of the YCT/HSK tests which are established by The National Chinese Language Office and the Confucius Institution in Beijing, China. China Reisen Reiseveranstalter Chinas bieten Reservierungsservice von Reisen in China an. Spezialisiert auf maßgeschneiderte und nach Mass organisierte China Reisen für Individuum, Familie und Gruppe! Spanish Language Schools - Learn Spanish at our Spanish language school in Buenos Aires: Spanish courses, volunteer work, tours. Also Spanish lessons in Bariloche and Cusco Peru. Spanish Schools in Cartagena - The best Spanish Schools in Cartagena, Colombia. Chinese (Mandarin) in just 2 months!